Containment Protocols: RPC-047 is to be contained in a wall-mounted display case that is hung at 2.62 meters from the ground, and constrained within the display case to prevent unauthorized removal. Accessing the display case will require a special set of keys that are entrusted by four security personnel that are stationed outside of RPC-047's containment chamber. While in close proximity of RPC-047, onsite personnel are to deter from establishing visual contact and to vacate away from RPC-047. In the event of a containment breach, RPC-047 instances are to be immediately terminated on sight. 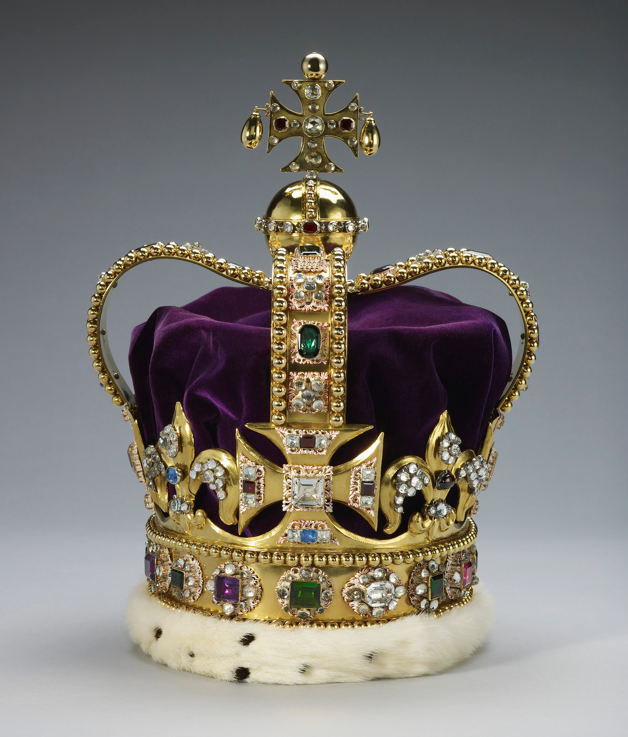 Description: RPC-047 is a British royal crown that resembles St. Edward's Crown that measures .31 meters tall, weighs 2.23 kilograms and is .66 meters in circumference. It has four fleurs-de-lis and four crosses pattée, supporting the two dipped arches topped by a monde and cross pattée, the arches and monde signifying an imperial crown. The anomalous properties of RPC-047 are evident when a subject establishes and maintains visual contact with RPC-047 for over 18 seconds, which causes the subject to approach RPC-047 and forcefully attempt to wear RPC-047 (referred as RPC-047 -1 henceforth). RPC-047-1 will act violent and authoritative and have been observed to refer to themselves as a Monarch of a non-existent kingdom. Additional subjects who come into contact with RPC-047-1 will also be affected by RPC-047's anomalous properties and will adhere to RPC-047-1 (referred as RPC-047-2 henceforth). RPC-047-2's will tend to have erratic behaviour, having been observed to be both homicidal and suicidal (Refer to Addendum 047.01). However viewing RPC-047 through other methods, such as photography or video imagery, does not appear to provoke the Cognito-hazard effects. Acquisition: As part of an established agreement between the Authority and GoI-0224 ("MI13"), or Military Intelligence Section 13, all anomalies in possession by the British Government were immediately transferred to the Authority. Furthermore, any intelligence operations on suspected anomalies across Great Britain and Overseas territory were to be jointly shared with The Authority. One of these acquisitions being transferred to the Authority was RPC-047. According to historical documents, following its apprehension, RPC-047 was originally taken into government custody in 1649 when Charles I of England was executed for committing high treason during the early stages of the English Civil War. However, it was later revealed that RPC-047 was secretly hidden away in an early form of a government storage facility that was under control by the British Government at that time. By 1904, the Esher Report had shifted the aforementioned government facility into a subsection field office for MI13, and a containment facility for anomalous entities. Since then, the government facility has been redesignated as JS-Site-23C as part of the agreement between MI13, and the Authority. Addendum 047.01: Research Log of Anomalous Properties. Foreword: Experiments commenced at 1900 hours GMT PM and had been supervised by Dr. Walker. Four CSD personnel were escorted by security personnel to the containment chamber and have been instructed to not observe at RPC-047 unless being instructed otherwise. Dr. Walker: D-0985, you may remove your blindfold and have a look at RPC-047. CSD-0985: (Removes blindfold and views RPC-047) All I see is a dumb royal crown at an opened display case. Dr. Walker: Yes, what are your thoughts on it, CSD-0985? D-0985: It looks like a normal crown that obviously looks expensive. (CSD-0985 remains silent for a moment and slowly begins walking towards RPC-047) I-is that a diamond? Dr. Walker: CSD-0985? Can you repeat your last sentence? [Note]: RPC-047's constraint was removed for the purpose of the experiment. CSD-1256: (CSD-1256 can be heard speaking) H-hey? Can someone tell me what is going on?! Dr. Walker: All blindfolded CSD personnel within the chamber are to remove their blindfolds now. RPC-047-1: Loyal subjects! Bow down to your King for I, King Alexandra the 1st, shall be the ruler of this great land! Supervisor's Note: While all CSD personnel, who have succumbed to the anomalous effects of RPC-047, have been terminated as part of protocol; there is no current method of undoing the effects following initial contact with either RPC-047, or RPC-047-1. Previous attempts to have a CSD forcefully remove RPC-047 from RPC-047-1 without being affected during the process has been unsuccessful so far. - Dr. Walker.